New research by scientists from the University of Southampton has found that water molecules react differently to electric fields, which could provide a new way to study spin isomers at the single-molecule level. Water molecules exist in two forms or ‘isomers’, ortho and para, that have different nuclear spin states. In ortho-water, the nuclear spins are parallel to one another, and in para water, the spins are antiparallel. The conversion of ortho water into para-water and vice-versa is relevant to a broad range of scientific fields from nuclear magnetic resonance (NMR) to astrophysics. While it is possible to separate ortho- and para-water molecules it is difficult to study them in bulk water because rapid proton exchange and hindered molecular rotation obscure the direct observation of the two spin isomers. 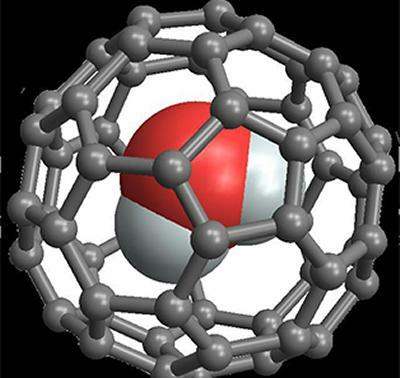 To help observe this transformation in bulk water, the Southampton research team confined single water molecules in C60 carbon cages or ‘buckyballs’ to produce supramolecular endofullerene H2O@C60. The yield of this chemical synthesis was improved dramatically by the team, allowing them to study bulk quantities of this substance. The carbon cages prevent water molecules from freezing and keep them separate, so that they continue to rotate freely at very low temperatures, making it possible to study the conversion. Since water has an electric dipole moment (a measure of the separation of positive and negative electrical charges), the researchers measured the dielectric constant of H2O@C60 at cryogenic temperatures and found that it decreases as water converts from ortho to para, in line with quantum theory and previous NMR studies. The research, which is published in Nature Communications, was funded by the Engineering and Physical Sciences Research Council (EPSRC), European Research Council (ERC) and the Wolfson Foundation.